Although our fine handmade or machine made rugs are made for generations of enjoyment, they sometimes need the skilled attention of a repair professional for re-weaving, patching and reinforcing the weak areas so that the rug can be enjoyed by your next generation. 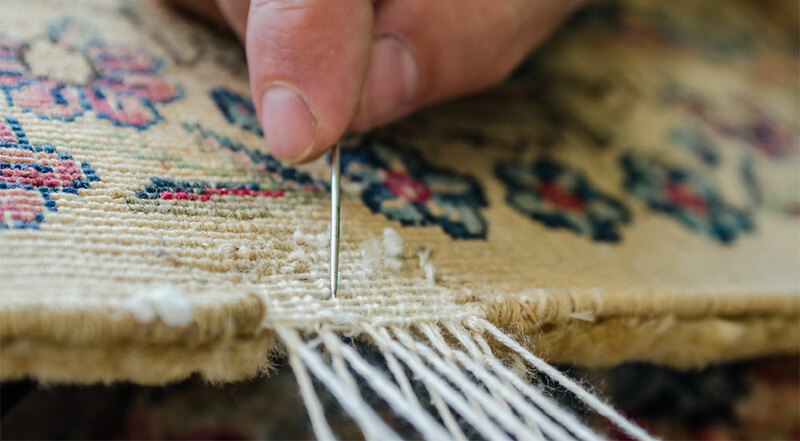 Spills, cigarette burns, wear and tear, and other mishaps can ruin a small area of your beautiful rug, making it necessary to remove or re-weaving the section as a way to repair the damage. Even without such spills, burns or other mishaps a particular area of a rug can get weak and from moving heavy furniture, normal or heavy foot traffic on a regular basis, and other damaging occurrences. Fortunately, the task of patching,re-weaving and reinforcing weak areas of a damaged carpet is relatively easy and requires nothing more than a little time but only if done from an expert craftsmen. In our full service facility we offer rug patching and reinforcing weak areas to restore the beauty of your rugs.